What advice would you give to an adult child who is a caregiver of a Senior, Toula? What would you tell a senior who is receiving care? It isn’t as easy as you would think, is it? Even though you have plenty of experience as a caregiver, it is still hard to share your lessons. Last week I attended the American Society on Aging conference in Chicago. During my week there, I met Dr. Eloise Stiglitz, owner of “Embrace Your Aging”, in Maitland, FL. 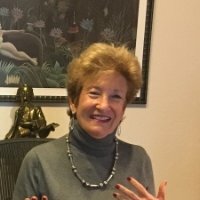 She is a life coach who helps Seniors and their Adult Children. I was very impressed with her advice and stories. I know you will be, too.